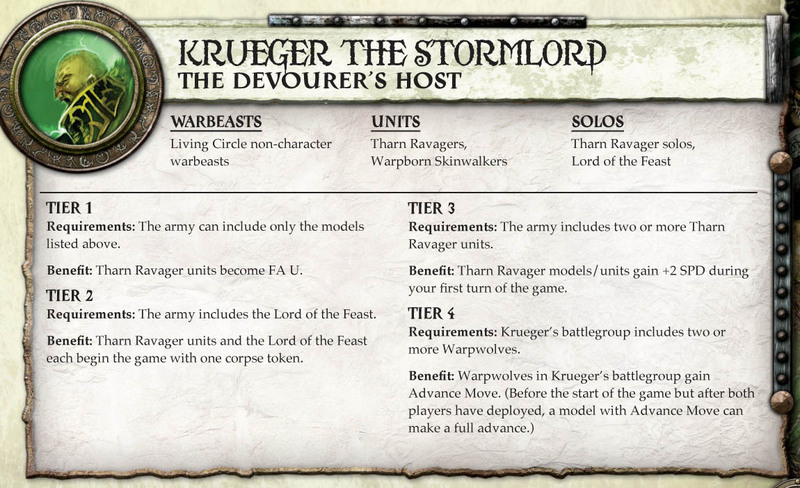 Bell of Lost Souls has spoiled the Theme List for Krueger the Stormlord, otherwise known as eKruger, otherwise known as Señor Kinda-Like-Rahn-But-More-Crazy. I think we could predict that the Tharn were going to be part of the theme list since Krueger is Kromac’s mentor, though I have no idea what the Skinwalkers are doing in the picture (besides very slowly advancing up the field) — we are still lacking much of a sense of their fluff, and they were also included in eKaya’s theme list spoiled last month. We do know from the most recent No Quarter that Krueger runs with Warpwolves, however, at least in the fiction. This list may be thematic, but I had held out hope that it might be competitive, as well. 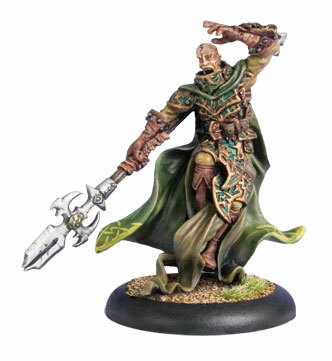 I have been really enjoying playing with eKrueger so far, and am looking to make him a regular choice of mine on the tabletop. But the lack of Woldwardens makes this list seem not very effective. eKrueger has an expensive spell list, and there are no upkeeps. The Woldwarden’s geomancy really makes it possible to get the most out of Krueger by giving him an avenue for getting cheap spells. Krueger has a little to offer the warpwolves, however: Telekinesis gives them an extra two inches of move as long as you activate Krueger first, and Storm Wall reduces the chance that they will be shot on the advance. But of course, the fact is that the Theme Lists aren’t about being competitive. The point is that the lists are not competitive, so the theme list advantages are intended to offset that fact somewhat. This isn’t to say that there are no competitive Theme Lists, as there certainly are (some by accident, to be certain), but the stated intent is to give players some measure of compensation for fielding a force constrained by the fiction of the different warcasters and warlocks. It gives designers some new ways to introduce some radical options while tightly controlling the conditions under which the options are available. And, of course, there is also some element of giving players a new hook to spark discussion: how many points you need to make a theme list, which tier is most valuable for which caster, and even which Theme Lists are competitive. In a game with an explicit goal of balanced forces competing on a level playing field, I can see why this approach would cause some confusion. In addition, the personality of those who choose to discuss the theme forces online may be selecting for a view of the game. I may have the advantage that I started down the Privateer path when I listened to the D6 Generation summary/review of Mark II Warmachine, and the Theme Lists were one of the ideas that appealed to me. Not that I have any intention of fielding one before I know the game better, I feel like the Theme Lists are a little bit of the advanced class.